These are flint tools from the Neolithic Age. They are about five thousand years old. Number one is a scraper found at Chanctonbury Ring. Number two is a knife from Cissbury Ring. In Neolithic times people first began to cultivate crops and keep farm animals. These tools would have had many uses such as butchering meat or preparing skins to make into warm clothing. 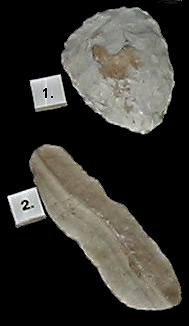 High quality flint was mined at Cissbury by Neolithic people and Cissbury flint tools have been found as far away as the Eastern Mediterranean. See our article about the Downs above Steyning in prehistoric times HERE.